So what did people think about the purity of gold in medieval times? Talking with a re-enactment friend about reproduction medieval jewellery, the subject of the purity of gold naturally came up. This is of course of great interest to moneyers, Kings, alchemists and jewellers. The latter were expected to produce jewellery of a specific purity of gold, and if they did not, they would be fined. In general in medieval Europe, the products of goldsmiths were tested, usually with a touchstone, and a mark stamped upon them to certify this purity. This method is still in use today, except that sometimes the mark is applied with a laser rather than by hand. Hand punching requires a lot of skill, since you are basically hitting a small metal object with a heavy hammer on a narrow headed punch, so there is great potential for distortion in the object. Anyway, back to the purity levels of gold. My usual starting place for this sort of thing, “English Medieval Industries” has a lot about the social history part of being a goldsmith, the marks used (including that quite a lot of pieces don’t have a proper set of marks on them at all, which seems odd unless you reckon the law wasn’t followed as well as it should be) and not a lot on the purity. In one place they do mention that modern gold foil is 23 and a quarter carat with 3/4 of a carat of silver and copper. You can’t make gold foil much less pure than that because the alloy doesn’t beat out flat enough. However this book was published in 1991, and is well due a new edition. At this point it should be made clear that a carat was a proportion, with there being 24 carats in total, so 12 carats would be half gold. The final place to look would of course be works on coinage, since the purity of coins went up and down depending on circumstances, but I don’t have much about that. Theophilus’ 12th century work “on Divers arts”, instructs in the use of gold a lot, and on method of cementation, but is remarkably quiet, from my skimming through it, about exactly how pure your gold should be. The only exception is with regard to making gold leaf, which requires pure gold. Which you could make using cementation of course. Certainly people found higher gold alloys to be more valuable, but from memory, most mention of gold in alchemical works specifies “good” gold, whatever that is. There is much more concern with the methods of testing gold and how your alchemically made gold will withstand them. Yet if you consider the false alchemists, the swindlers such as in Chaucer, there must have been some concern with the purity of gold, because some methods do require gold alloys, or make gold alloys, which when treated properly will appear to be pure gold and thus have multiplied the original gold 3 or 4 fold. The Book of the quintessence, mentions “fine gold”. Now some authors talk about making pure gold and it being better than normal non-alchemical gold, but that is more a thing of perfection than of the modern ideas of purity. It seems to be assumed that everyone knows good quality gold and will recognise it. Of course sight alone is not a good indicator of the proportions of metals present. In Chaucer’s Cannon’s yeoman’s tale, the intent is to make “fine and good” silver, which presumably means pure; there seems a lack of definite medieval information, but nowadays fine silver means 999 parts per thousand, i.e. nearly pure. From the “Goldsmiths” book we have a number of examples of bad goldsmithing such as the 1441 case in which the Prior of Lewes sent a gilt ship to the Goldsmiths company in London. It was tested and found that 9 of the turrets were stuffed with tin and lead, i.e. not all properly gold. The Lewes goldsmith was noted in the register of the company as making a bad piece. In 1478 an assayer was appointed to test and mark all gold and silver objects at Goldsmiths’ hall. At this time the standard of gold purity was 18 carats, so obviously they were testing against that standard. The records of the Goldsmiths’ company in London have examples of how customers were defrauded. They include plating base metal with gold or silver and pretending it was all that metal; rings and buckles made hollow but passed off as solid; false glass stones were used or real ones in copper or latten. There was also concern with weights in use to weigh gold and silver objects. Obviously, if the weights were wrong, someone would be defrauded. E.g. if you had weights that were slightly too light, you might weigh someone’s gold object as being 3.5 ounces instead of 4, give them money on that basis, then sell it on again as a proper 4 ounce weight object. So in summary, the purity of gold objects did matter, but obviously being a real industry, goldsmiths in medieval times were concerned with specific percentages of gold. From what I’ve read, the exact composition didn’t matter so much, and the colour of the gold probably varied somewhat from object to object. But all were gold. It looks not dissimilar to the copper plated coin beside it. Red gold has a lot of copper in it, but of course will be somewhat more corrosion resistant than non-gold alloys. I don’t think medieval people liked this sort of shade much though, because why waste gold in a not very gold coloured item, when it could be in a proper gold coloured item instead? 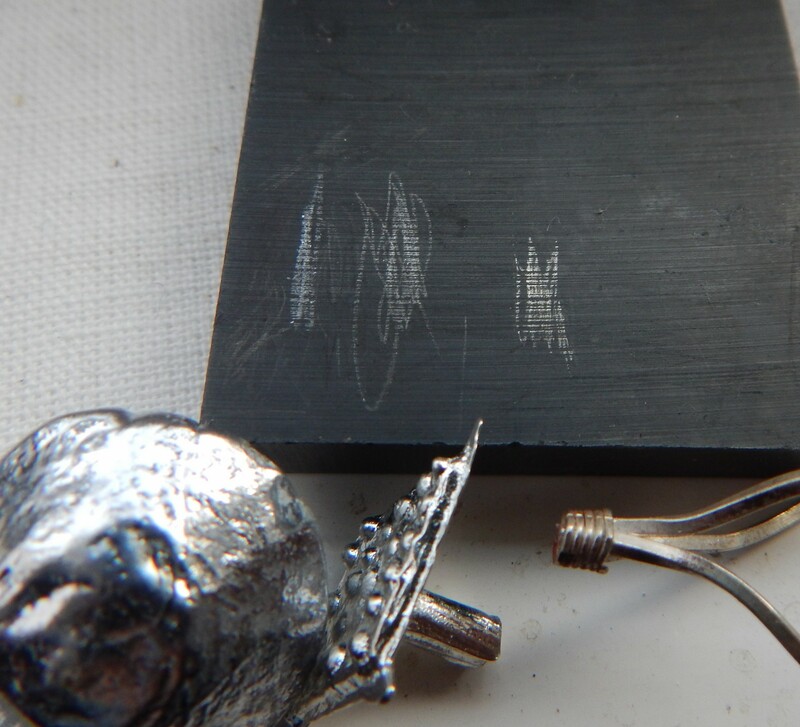 I realised I hadn’t written about this method of knowing what purity of metal you have, despite how important it is in gold and silversmithing, and of course it is relevant to alchemy because it is a simple way of checking if you have made true gold or not. Historic ones were made of dark dense hard stone, such as, according to the note in the Sisco and Smith translation of Lazarus Ercker’s book on assaying, fine grained black rocks such as quartzitic schists or like jasper, or even hard slate.